Ce wébinaire est destine aux développeurs Sencha ou non. 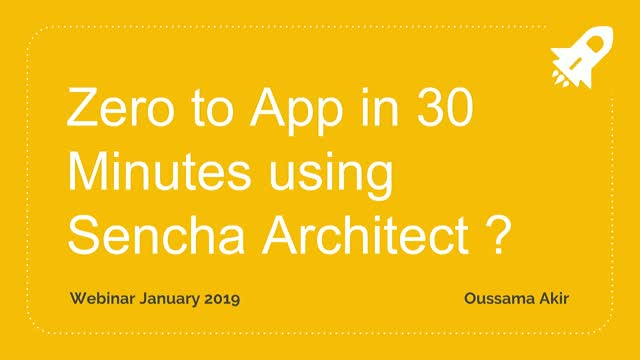 Nous vous montrerons de façon très pratique et visuelle comment développer en moins de 30 minutes une application web interatictive, visuellement attractive et riche en données en utilisant les capabilités de Sencha Architect. Oussama Akir est MVP pour Sencha Ext JS et utilise cette technologie depuis de nombreuses années. Venez découvrir comment. Ce sera un déjeuner de travail très instructif! Learn about Sencha’s newest release, ExtAngular: the most comprehensive set of components for Angular apps. Now you can quickly and easily add any of our 115+ professionally tested and supported components including grid, tree grid, pivot grid, charts, D3 visualizations, trees, calendar, buttons, menus and more to your Angular applications. - Build data-intensive, cross-platform web apps leveraging Sencha components and Angular. - Build immersive user engagement using layouts and adaptive design features. - Leverage material design and other themes to save time and effort. Modify or extend themes without writing a single line of code. Want to learn how to build enterprise-grade, data-intensive web and mobile applications fast? - Rapidly develop and deploy web, mobile and desktop applications with one single source code. - Create beautiful and scalable data-intensive applications that will evolve alongside web technologies. - Use the most comprehensive component library that includes our powerful pivot grid, calendar and data visualization tools. We invite you to join Sencha product experts for an hour to ask us anything! We encourage Sencha customers to join and ask any technical or product related questions across the Sencha product suite, or you can simply join to listen to what other customers are asking about. We hope you join us and take advantage of one-on-one time with our team of Sencha product experts! Join us for a free training session and learn how to build an ExtAngular application. We'll explain what's different from the Ext JS application build process and you'll see how you can save development time using our robust component library with your Angular apps. Join us for a free training session and learn how to build an ExtReact application. We'll explain what's different from the Ext JS application build process and you'll see how you can save development time using our robust component library with your React apps. We recently announced the release of Sencha Ext JS 6.7, which includes enhancements to the Modern and Classic toolkits, tooling updates for ExtGen, Cmd and the JetBrains, Eclipse and Visual Studio IDE plugins, and new Ext JS examples. You will also see what’s new with Ext JS tooling, including updates to ExtGen, Cmd and IDE plugins. Bring your questions and our team will be happy to help you during our live Q&A. This webinar will showcase the benefits of incorporating automated testing into your application development process and we’ll demonstrate how you can test your Ext JS apps using Sencha Test. We’ll show you how to generate stable locators for components, leverage the Future APIs to more easily reference and interact with those components, and structure your tests using Jasmine. If you are a new or existing user, we’ll cover various examples and tips that will help you to gain a greater insight into the use of Sencha Test for testing your own applications. Our upcoming Ext JS 6.7 release will include an exciting new product -- Ext Angular! With ExtAngular developers can use all 115+ pre-built Ext JS components, Ext JS layout system and theming environment with the Angular framework. Progressive Web Applications (PWAs) allow developers to deliver the best of both web and mobile app experiences, ensuring every user has access to the same, most recent version of an application. PWAs are fast, integrated, reliable and provide immersive web experience across all device form factors. Mobile app capabilities, such as offline support and optimizing access to the underlying network using service workers, take the user experience to a whole new level. But the big question remains: do all of the above features make PWAs enterprise-ready? Enterprises need to think about security, access control and compliance with privacy rules, along with containment and isolation of business data from personal data when the data is available for offline use. Enterprises also must deal with the management and provisioning aspects of deployment to ensure a consistently high-quality user experience. One of the coolest features of Ext JS 6.6 is the ability to easily create universal applications with the new Ext JS Open Tooling. What are universal applications? They are applications that share a single project base and support different device profiles, like desktops, tablets and phones. The structure of a universal application allows for the rescue of business logic, data access logic and even some view logic across the different platforms. In this webinar you will see a live demonstration of Ext JS with Open Tooling and learn the steps for creating a universal application. Join us to learn what’s new in ExtReact 6.6! This release includes support for the latest React framework version 16.5, including hundreds of pre-built UI components that you can easily integrate into your React 16.5 apps. ExtReact 6.6 adds new components, new theming options, new tooling, and new examples to help you create visually stunning React applications for your desktop and mobile devices. - Support for the latest React 16.5 framework that is built on an entirely new underlying architecture, including support for the React dev tools profiler, updates to React DOM events, new scheduler and a number of bug fixes. - Support for Webpack 4, a static module bundler with performance improvements. - New ExtReact Application Generator to easily create ExtReact 6.6 based React apps. - New modern components - Time Panel, Time Field, and Gauges component with needles. - Widget cells support within grid rows to create advanced Grids that include widgets like button, progress bar, sparkline, etc. - Classic accessible components support along with the new beautiful accessible Graphite theme. - New Sencha Themer 1.3.3 support for ExtReact 6.6 apps to create customized themes for your apps. - Sencha Test 2.2 support for ExtReact 6.6 apps for end-to-end testing of ExtReact apps. - Updated Sencha Fiddle to support building ExtReact 6.6 apps. - Updated examples illustrating the use of REST API, TypeScript, modern components, conference app, classic components, and component kitchen sink. Sencha Test helps you improve application quality, accelerate time to market, and reduce testing time and costs by creating unit and end-to-end tests quickly, and execute tests on multiple browsers simultaneously. Sencha Test is the only dedicated solution for applications built using Ext JS and ExtReact, and includes enhanced capabilities for end-to-end testing of web applications including those that are built using React and Angular frameworks. Join us for a webinar on June 6th to learn how Sencha Test 2.2, our latest release, can help you with the critical steps of developing your test automation strategy including test design, managing defects, and storing results. Join us for a webinar where you will learn how to quickly and easily add any of our 115+ professionally tested and supported Ext JS components including grid, tree grid, pivot grid, charts, D3 visualizations, trees, calendar, buttons, menus and more to your React or Angular applications. You will also get a sneak peek into plans for NPM and webpack tooling for Ext JS. Join our upcoming webinar on April 17th and learn what’s new across Sencha’s latest product releases, including Ext JS, ExtReact and Cmd 6.5.3, Architect 4.2.3 and Themer 1.3.1. - Ext JS and Cmd 6.5.3: Improved components - Grid and NestedList, new component SplitButton and bug fixes in both the modern and classic toolkits, Android 8 Oreo and latest Chrome support. - ExtReact 6.5.3: Support for several component enhancements and the new SplitButton component, as well as support for Themer 1.3.1. - Architect 4.2.3: Drag and drop new components from Ext JS 6.5.3, develop using ES6, and import themes from Themer 1.3.1, enabling you to quickly build business-critical web applications. - Themer 1.3.1: Support for Ext JS 6.5.3 enhancements and new components, including the new Ext JS UI Mixins and support for ExtReact. To make your web applications successful, you have to get to market quickly and deliver a great user experience across desktops, tablets and smartphones. A recent study by Dimensional Research reports that 94 percent of its participants say web technologies remain critical to their development process. 78 percent reported the need to visualize and analyze complex datasets is expanding as well.